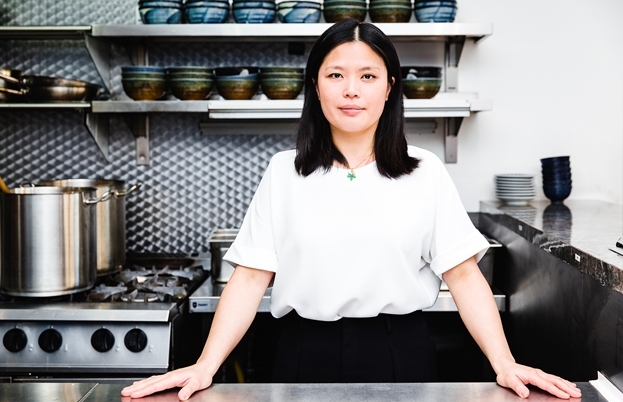 Mandy Yin dropped a career in corporate law to follow her passion for food. 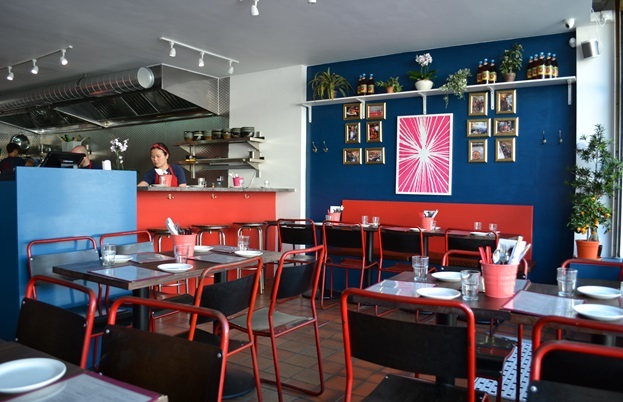 Today, she is showcasing Malaysian cuisine in all its glory at London laksa bar Sambal Shiok. There are few cities around the world that can boast the multicultural food scene of London. The beauty of the city lies in how readily it has accepted people from so many different cultures and backgrounds – those people are not just guests in London; they are London, and London is them. As a result, anyone who lives in or near the capital is blessed with the opportunity to eat almost anything they like, from hyper-specific regional delicacies of India and China to far-flung cuisines of South America, Africa and Australasia. It’s quite incredible when you think about it – people from every corner of the world have settled in this one place, and brought hundreds – sometimes thousands – of years of culinary history with them. I’m sure there are plenty of visitors who hear the hype and come like moths to flame, only to find the laksa too hot to touch. It raises a number of interesting questions around the value of authenticity in London and how far a restaurateur should go in order to sell exotic cuisine to a new crowd. 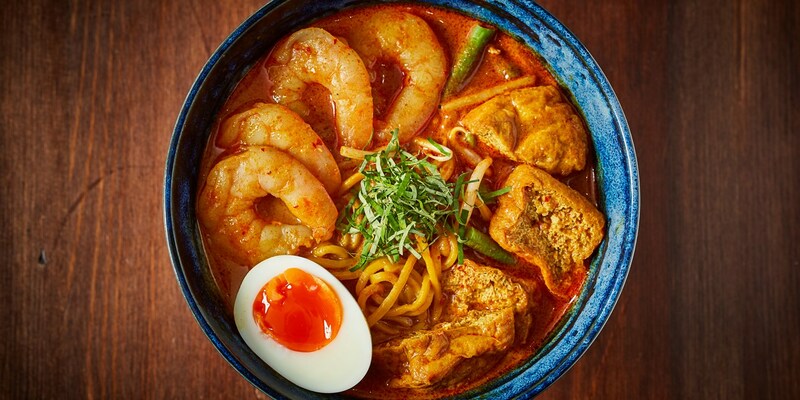 Mandy refuses to describe her food as 'authentic' – ‘there are thousands of different recipes for laksa,’ she explains – but her recipes stay true to her heritage. Born to Peranakan Chinese parents and raised in Kuala Lumpur, her laksa incorporates telltale signs of both. 'My focus is on taste,’ says Mandy. ‘Does it taste good? That’s all that matters to me. My laksa is sort of based on Penampang laksa, from Malacca (where most Peranakan Chinese have lived for generations). It’s very spicy – lots of heat and tamarind, but it also has lots of shrimp paste, which is typical of Kuala Lumpur. ‘If you go to Malaysia, every family will have a different recipe for laksa,’ she continues. ‘This is my laksa, and it’s my restaurant, so…’ She tails off – the audible equivalent of a shrug emoji. 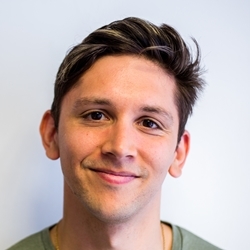 It’s a difficult choice that many restaurateurs in Mandy’s position face – do you compromise your own vision in order to satisfy more of your potential customers? In sticking to her guns, Mandy has made London’s culinary landscape richer, even if that means some of us need to order several glasses of rose milk from the menu. With London in the midst of a street food revolution, Mandy threw caution to the wind. The seed of an idea was planted in 2012, and by 2013 she had already set up Sambal Shiok, selling chicken satay and beef rendang burgers at lunchtime markets around London. Surrounded by barbecue pulled pork stalls, she figured she’d beat them at their own game. ‘Rendang is kind of similar, but better,’ she shrugs. 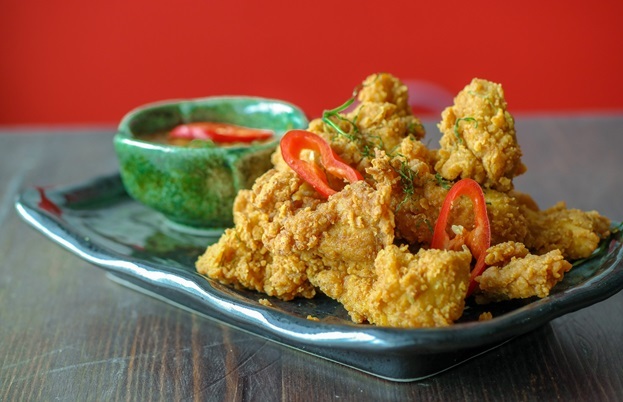 The food went down a storm, and Sambal Shiok gathered momentum, appearing at residencies all over London and often selling out venues. The idea to refocus as a laksa bar came a little later, courtesy of friends Matt Chatfield and wine consultant Zeren Wilson. They were lamenting the absence of good laksa in London, and encouraged Mandy to fill the gap in the market. ‘I owe them a lot for pointing me in that direction!’ she admits. The trio partnered up to throw a week of laksa nights – Matt provided the venue, Zeren brought the wine and Mandy rustled up the food. It was a complete smash – a sell out. 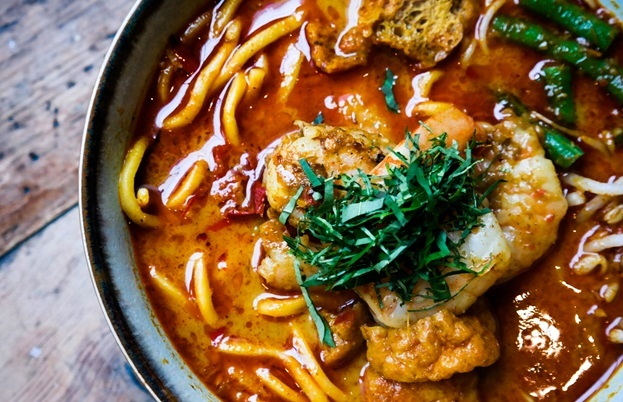 ‘It cemented how much people wanted laksa in London,’ says Mandy. Sambal Shiok Laksa Bar, as it is now, was born. Ultimately, Mandy’s food at Sambal Shiok is not so much a representation of Malaysia as a representation of her. After all, how do you represent an authentic vision of something as diverse as Malaysian cuisine? The best you can do is show an authentic vision of yourself. ‘My food is, really, a natural evolution of me,’ she says. ‘I grew up in Malaysia, but I also grew up here, and there are lots of things I love eating here that have influenced my cooking now. ‘Ultimately, I want to be as inclusive and loving to everyone as I can,’ she says in closing. ‘We only serve halal meat at the restaurant – the majority of the people in Malaysia are Muslim, so we want them to be able to eat here. We have a big focus on vegetarian and vegan food on our menu. It’s all about including people, and showcasing Malaysian food in all its glory.’ Just don’t ask them to hold the chilli.